US policy in Central America under Trump appears to be shifting from bad to worse. This week, the leaders of Guatemala, Honduras, and El Salvador are gathering in Miami with Vice President Mike Pence, Secretary of State Rex Tillerson, Homeland Security Secretary John Kelly and Treasury Secretary Steven Mnuchin for a “Conference on Prosperity and Security in Central America.” The conference, co-hosted by the United States and Mexico, seeks to revamp strategies to stem the tide of mass migration from Central America’s Northern Triangle nations by addressing the root causes of poverty and insecurity. The meeting comes amid fraught circumstances. Trump’s proposed 2018 budget threatens to slash US development aid to the Northern Triangle while doubling down on security and pro-investment policies that have already wrought significant damages in the region. The meeting is the first of its kind to be held during the Trump presidency, and it appears to portend a shift from bad to worse for US policy in Central America. In the summer of 2014, Central America was thrust back into the US spotlight for the first time since the brutal US-backed wars of the 1980s. During the so-called “child migrant crisis,” seventy thousand unaccompanied children and an equal number of mothers and children arrived seeking asylum at the US-Mexico border, as images of mothers and children fleeing poverty, gang violence, and domestic abuse filled the headlines. For a moment, the North American public was confronted with the bitter legacy of US financing, training and arming genocidal dictators, supporting corrupt oligarchs, and promoting devastating deregulation and privatization regimes in the region. Any reckoning with the ravages of imperialism was short-lived, however, and the crisis became an opportunity for the United States to deepen its longstanding agenda in Central America, first under President Obama and now under President Trump. This policy was molded into the Alliance for Prosperity (APP) in the Northern Triangle of Central America, a document released by the Inter-American Development Bank (IDB) along with the governments of Honduras, Guatemala, and El Salvador in late 2014. While claiming to advance a new strategy, the US’s funding agenda has continued to prioritize security and military assistance, and touted privatization and foreign direct investment as the key to fueling development in the region. The APP calls for investment in economic opportunities, human capital, citizen security, and strengthening institutions. These bland, technocratic terms disguise a radical, if familiar, economic program — one that the United States has been seeking to advance along with local elites for decades. The plan builds on other attempts to secure US corporate and military interests in the region – from the Cold War-era Alliance for Progress to the failed Plan Pueblo Panama. The bulk of the plan centers on further liberalization at the expense of workers, public services, and the environment: it advocates for privatization through public-private partnerships, free-trade zones with special regulatory and fiscal exemptions for private foreign investors, the maximization of eight “logistical corridors” connecting ports and cities across the region, and the exploitation of natural gas resources. The Alliance for Prosperity’s goals were reflected in Obama’s White House Strategy for Engagement in Central America, which paired increased development-oriented funding with security aid. The package, which was pared down by Congress, modestly – and belatedly— increased resources and programs to take in children fleeing violence who did not fit under the legal definition of refugees. Vice President Joe Biden called the White House strategy a Plan Colombia for Central America, drawing alarm from human rights advocates and regional solidarity groups who noted Plan Colombia’s devastating legacy of state violence and mass displacement. From the outset, blocking migration was a key component. Congress conditioned 25 percent of the $750 million approved in Obama’s FY2016 budget request both on the Northern Triangle country’s commitment to cooperating with escalating deportations, further “securing” their borders, and running media campaigns to dissuade its citizens from leaving. The United States also pressured Mexico to scale up its immigration enforcement — essentially outsourcing the work of criminalizing, jailing and deporting Central American migrants — through Plan Frontera Sur, resulting in a major spike in deportations from Mexico, which now outpace US deportations of Central Americans. It has also made migrants more vulnerable to robberies, rapes, extortions, and kidnappings by driving them from established routes into increasingly dangerous territories. Mexican authorities are routinely implicated in abuses against migrants in transit and asylum-seekers. Together with Mexico, the Obama administration worked to push border militarization ever southwards. In 2016, for example, a US-backed Tri-National Anti-Gang Task Force was established in the Northern Triangle to focus on gangs and trafficking of arms, drugs, vehicles, and humans. These initiatives are designed to combat legitimate challenges posed by narcotrafficking and organized crime, but they raise serious questions about the fate of migrants, refugees, and even tourists who encounter these units. Under the Central America-4 Border Control agreement, citizens from El Salvador, Honduras, Guatemala, and Nicaragua enjoy the freedom to travel without a passport between all four Central American nations, yet in 2016, Guatemala’s US-trained border agents refused entry to 400 Salvadorans on suspicion of being gang members. Under Obama, Central American governments were incentivized to accept US economic and security strategies with the promise of hundreds of millions of dollars in development aid. In reality, they appear to have little choice. The outsized economic and political influence that the United States exerts leaves little room for maneuver from the impoverished Northern Triangle nations. The Trump administration, however, prefers the stick to the carrot. Under the leadership of Department of Homeland Security Secretary and former US Southern Command Chief John Kelly, the administration has proposed major cuts to foreign aid and refugee assistance and is leaning on Mexico to do more of the United States’ dirty work of detaining, screening, and deporting Central Americans, as well as to further militarize its southern border with Guatemala and train Central American security forces. Under Trump, the State Department has taken a back seat to the Department of Homeland Security — which is subject to much less oversight or public scrutiny — in shaping US-Central America policy. Kelly’s leadership, along with the FY2018 budget request’s preference for defense over diplomacy, suggests a troubling escalation of the militarization of US foreign policy, one that will only make Central American families forced to undertake the perilous journey northward more vulnerable. Trump’s 2018 budget proposes a massive reduction in aid worldwide, with Central America’s economic assistance down 39 percent from its peak in 2016. The proposal slashes the US Agency for International Development’s (USAID) budget by 75 percent and eliminates US funding for the IDB. Refugee services would be cut by 31 percent, and the Emergency Refugee and Migration Assistance Fund, designed to help respond to unanticipated crises, would get nothing at all. Aid to Mexico would be cut in half. At the same time, the administration wants to raise defense spending by 10 percent and build seventy-four miles of border wall at USD$21 million per mile. The Trump administration isn’t offering the Northern Triangle much, but it’s threatening plenty. Two weeks before the Miami conference, Kelly suggested he may move to end the Temporary Protected Status that shields 263,000 Salvadorans and 86,000 Hondurans in the United States from deportation. Mexico, in turn, hopes to score points with the United States in exchange for a favorable outcome to the threatened renegotiation of the North American Free Trade Agreement (NAFTA). In lieu of development aid, the Trump administration is doubling down on the Alliance for Prosperity’s emphasis on attracting private foreign investment to Central America. Secretary of State Rex Tillerson’s remarks described the Miami conference as an event to discuss “how we can bring more private capital into investment opportunities in Central and Latin America.” A day before the official activities, the IDB and the US Chamber of Commerce is bringing together corporations including Monsanto, Coca Cola, and Walmart to discuss investment opportunities. Day one of the conference is being organized by the State Department and held at Florida International University; activities will be similarly dedicated to further opening up the Northern Triangle’s resources and workforce to foreign corporations. June 16 is devoted to security and will be held at the US Southern Command headquarters. Secretary Tillerson will only participate in June 15’s events, leaving the rest of the conference to Secretary Kelly. In addition to the multinational private sector actors invited to attend, representatives from the European Union, Canada, Colombia, Panama, Costa Rica, and other nations will participate in the conference. Civil society groups representing the workers, migrants, and communities most impacted by these policy proposals, however, are notably absent. Those organizing on the frontlines against imperialism, neoliberalism, and militarization in Central America have no illusions about the threats that the new administration poses. 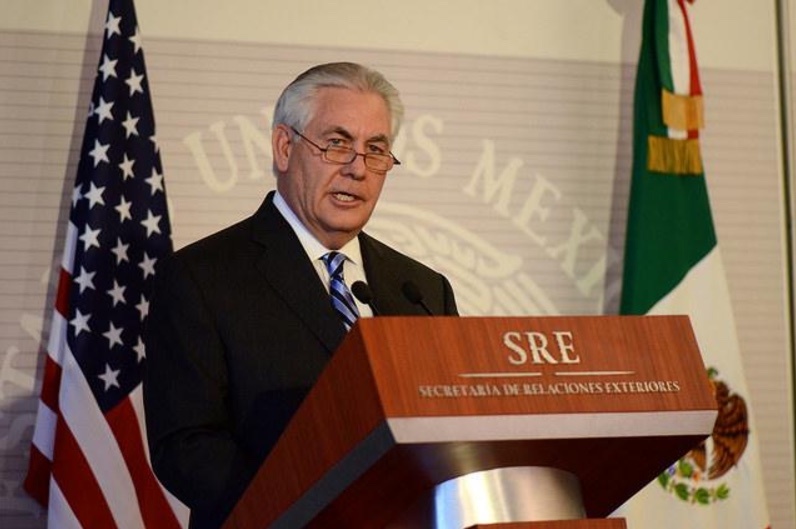 In a letter to the State Department delivered ahead of the event, over 100 human rights, environmental, labor, humanitarian, and faith organizations worldwide expressed concern “with the lack of consultation with civil society organizations from Mexico and Central America in the preparation for this conference” and its limited economic and security focus. Although Trump’s plans for Central America do not represent a dramatic departure from those of his predecessor, they are a dangerous escalation of enduring strategies that privilege the movement of capital and commodities over human beings. The consequences of such policies are devastating not only to migrants in transit, but also to workers in Central America who labor in increasingly precarious conditions, and to immigrants in the United States who are made more vulnerable to exploitation by criminalization. The result is a vicious neoliberal cycle of economic hardship, migration, and deportation that feeds the engorged industries of private prisons and defense contractors, while starving the region of the sustainable, inclusive, and equitable development it desperately needs. Whatever agreements the Miami conference produces, those least likely to benefit are the majority of Central Americans. Hilary Goodfriend is a writer and researcher based in San Salvador, El Salvador.